HomeLifestyleEssential Oils for Your Lady Parts! Just yesterday morning, the kids were driving me damn mental. I was screaming, they were screaming, my heart was pumping blood faster than it should have been and Daddy K… well there’s always Daddy K pretty much on autopilot chill out mode. Mostly fabulous, unless you need a little backing when coming up against team Kringo junior. I tried to rationalise with them. No avail. So I decided the best thing for me to do was storm out the house like some precious princess to collect my thoughts and regroup. Only issue. My adrenals were firing along like they had been fed red cordial and my sanity was long gone. I needed something to sort this family out. I sped on up to the clinic and made a direct line for the retail shelves. There sat the solution. Lavender and Sweet Orange essential oils. I was pretty pleased with myself. They made their way home with me and swiftly into our diffuser and there it began. Kringoudis calm (you can feel it can’t you?). We have used a host of essential oils in our home with AMAZING results. Very early on we began using it and saw an immediate change in Geordie’s health. We drew upon the air clearing and purifying properties of oils like lemongrass and added in others to help keep his mucus thin and his body health (cue eucalyptus, frankincense, peppermint amongst the faves). Fabulous for respiratory illness, keeping secretions (aka phlegm) thin and healthy as well as purifying the are and supporting immunity overall. A damn saviour in our home. I’d go as far to say, there’s probably not something you can’t safely treat with essential oils and with the right knowledge you too can become the master in your own home. This much I want to help you understand which is why I’ve joined forces with gorgeous Nicole to bring to you this one off evening event right here in Melbourne. 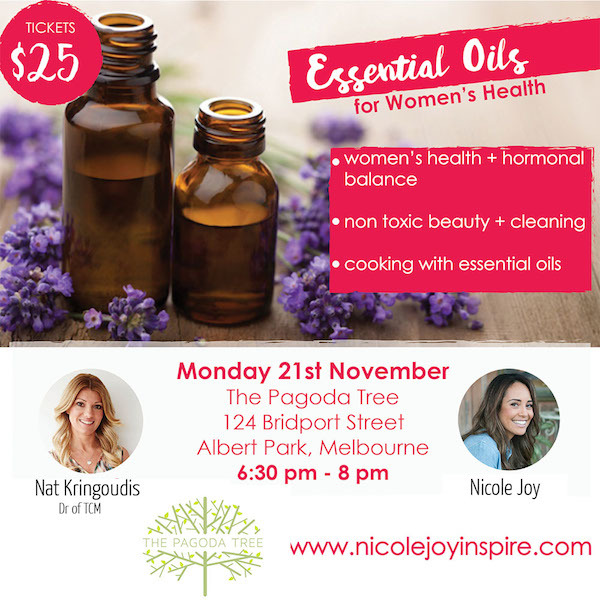 I’ll be talking all things Essential Oils for the Ladies! You may or may not have noticed that essential oils lately have become a bit of a ‘thing’. Truth is, essential oils are not a new thing, but there is a wave of education and awareness of the many benefits of essential oils BUT it is important to know, not all oils are created equally. So – Why doTERRA? They are as pure as it gets. Ethically and sustainably obtained as part of incredible co-impact sourcing initiatives throughout the world. doTERRA partners with growers to source the oils indigenously, which basically means where the plant originates and or thrives. To learn more about co-impact sourcing head on over HERE. The doTERRA Healing Hands Foundation is doTERRA’s non-profit organization committed to improving lives through partnering with organizations that offer hope to millions around the world. Healing Hands seeks to bring healing and hope to the world, for lives free of disease and poverty, and to ultimately empower impoverished communities with the tools needed to become self-reliant. One of the initiatives that really lights me up and adds the reason I love what this company stands for is doTERRA’s Healing Hands Foundation™ partnership with Days for Girls. Days for Girls works to provide every girl in the world the education, safety, and dignity that they deserve through direct distribution of sustainable feminine hygiene kits; by partnering with nonprofits, groups, and organizations; by raising awareness; and by helping communities around the world start their own programs. Thanks to a global grassroots network of thousands of volunteers and supporters on six continents, Days for Girls has reached women and girls in 75 countries. To learn more about doTERRA’s Healing Hands Foundation™ initiatives, you can check that out HERE. This looks like a great course. For those of us not in Melbourne, is there an option to join in? Or one in the making… pretty please. I love this post! Thanks Nat! I’ve been thinking about using oils in the home for awhile now, unfortunately I am in Sydney so can’t make this session. Can I ask what kind of diffuser you use? I know there are different types and I am looking for one. I love citrus and would love to use the sweet orange oil you mentioned, but I have read that ultrasonic diffusers shouldn’t be used with citrus oils.